Aerial refuelling is a key force multiplier essential for sustained military and humanitarian engagement around the world. Airbus has recently showcased automatic air-to-air refuelling (A3R) to the RAAF. The RAAF agreed to collaborate with European aerospace giant Airbus at the 2017 Avalon Air Show to develop groundbreaking A3R capabilities for integration into Australia's KC-30A Multi-Role Tanker Transport aircraft (MRTT). A3R will allow a tanker aircraft to autonomously guide the boom into contact with the receiver aircraft. During the initial approach of the receiver aircraft, the tanker’s air refueling operator (ARO) performs boom control as usual. Innovative passive techniques such as image processing are then used to determine the position of the receiver’s refueling receptacle. When the automated system is activated, a fully automated flight control system flies and maintains the boom aligned with the receiver’s receptacle. The telescopic beam inside the boom can be controlled in a range of ways, including manually by the ARO, a relative distance-keeping mode, or full auto-mode to perform the contact. The system requires no additional equipment to be installed on the receiver aircraft, and is intended to reduce refuelling boom operator workload and improve safety during the complex aerial refuelling process. David Piatti, the Airbus ARO onboard the A310, said that the system accurately tracked the receiver aircraft. “It can be very useful to be able to refuel another tanker or transport, for example, to extend its deployment range or to avoid taking fuel back to base, but it is also a challenging operation and this system has the potential to reduce workload and the risk involved,” Piatti said. 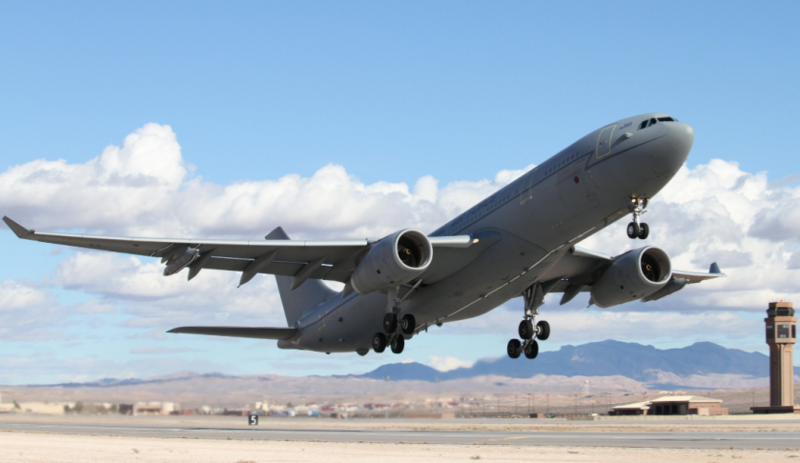 The trial was conducted off the Spanish coast in conjunction with test pilots and flight test engineers from the RAAF’s Aircraft Research and Development Unit (ARDU), with a Airbus Defence and Space A310 tanker serving as the testbed for the new capability to refuel an RAAF KC-30A MRTT. The KC-30A MRTT is a heavily modified Airbus A330 airliner, and enables the RAAF to conduct air-to-air refuelling and provide strategic air lift.